This summer I’m letting my nerdy, history-loving side out to play. I’ll be exploring various spots in Ohio, Kentucky and Indiana that were significant to the Civil War. 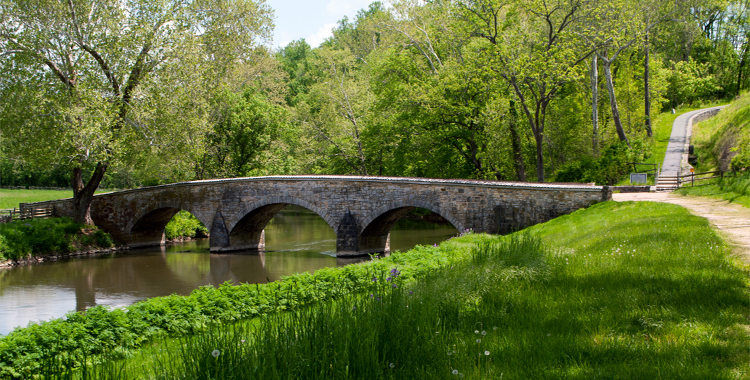 Burnside Bridge, named for the Union general who captured it from Confederate forces during the Battle of Antietam, was one of the last scenes of battle. Topography favored the outnumbered Confederate forces and helped them hold off Union soldiers for several hours. They say a picture is worth a thousand words, but what if the picture leaves you with no words, just feelings of shock and despair? In April, I took a quick, weekend trip to DC with Lacey. She was shooting a wedding, and we touristed it up for a day before coming back home. 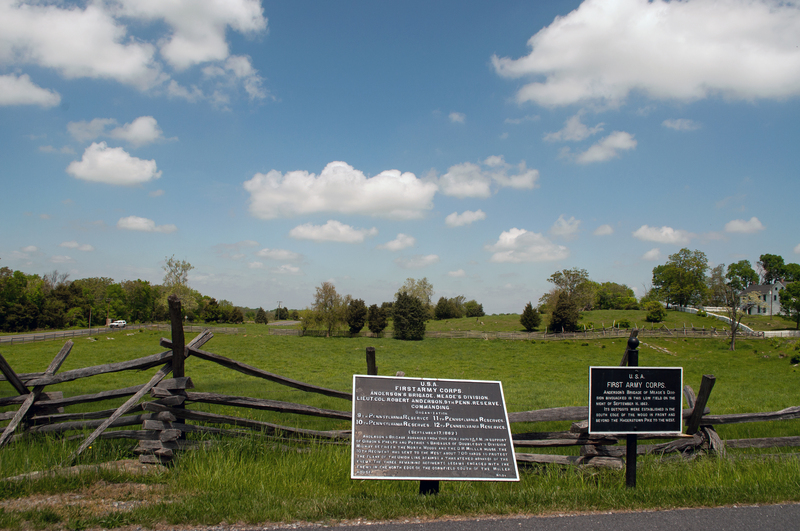 On our way back, we exited the highway looking specifically for a Sheetz travel center – which we did not find – but we did see a sign for Antietam Battlefield. It was close, only about 15 minutes off the highway, so we decided to break up the drive with some sightseeing. I wasn’t sure which war this battlefield was part of until we got there; years of memorizing places and dates in school just left me with a jumbled set of facts in my head. Thanks to a half-hour video narrated by James Earl Jones, we got a crash course on the bloodiest one day of battle in American history. It was a lesson in just how terrible human beings can be. After 12 hours of battle, nearly 23,000 soldiers were either dead, wounded or missing. The kicker with this statistic? That count is approximate. On September 17, 1862, Union and Confederate troops met at Antietam Creek. After 12 hours of battle, nearly 23,000 soldiers were either dead, wounded or missing. The worst part of this enormous number is that it is approximate. Because the losses were so huge, no one was able to get an accurate count. Think about that for a minute: So many lives were lost – in less than a day – no completely accurate count exists. At the time, Lincoln was looking for some kind of decisive victory to give him a wave of support on which to ride while he delivered the Emancipation Proclamation. Meanwhile, the Confederate Army was trying to get a victory of its own – by taking a piece of Northern territory. After the battle, photographers captured the first images of the field before the bodies were buried. The images helped show those still at home the horrors of war. After 12 hours of bloody battle, the Confederate force withdrew to Southern-held Virginia, technically making the battle a Union victory. But no one really won. The Union forces didn’t chase them back to Virginia, they just let them go. After the battle, photographers came onto the scene and captured the first images of a battlefield before the dead were buried. The Civil War was where photojournalism was born, but no one had seen images like this before. The scenes were haunting: Men and boys, someone’s father or brother or son, still lying on the ground, piled up next to half dug-graves. 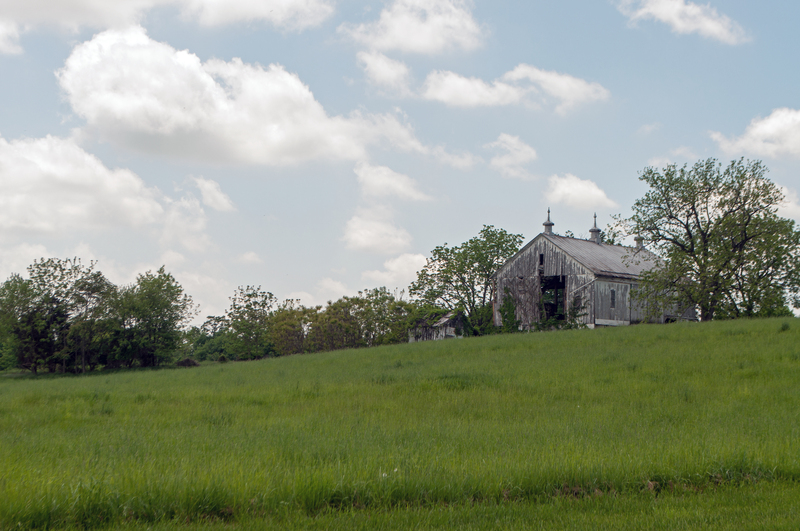 Today when you drive through Antietam, it’s hard to imagine it as the site of a terrible battle. The hills are peaceful, broken up by rocks jutting from the ground. These may have given precious little shelter from gunfire to the men and boys fighting around them. Trees cover many of the hills and green grasses wave in the wind, just as I’m sure they did before the first boots landed 153 years ago. By the time the battle was done, the trampled ground was soaked in blood. The Dunker Church was one of the focal points of the battle. Afterward, it was used as a temporary field hospital and later an embalming station before it was returned to the congregation. 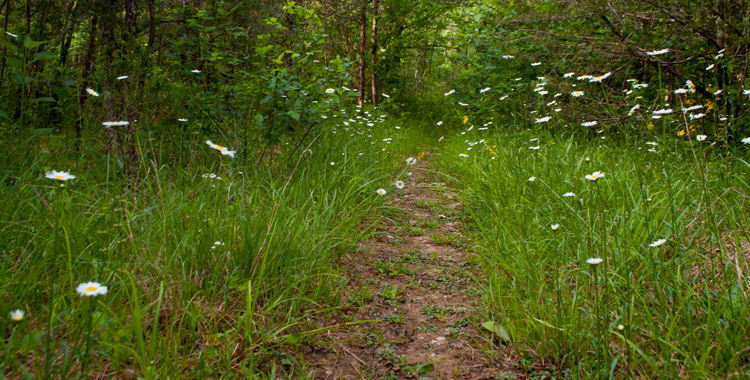 Even if you don’t have an itch to visit a Civil War battlefield, this is still a nice place to check out if you just want to take in some fresh air and sunshine. The driving tour gives you beautiful landscapes to see, and a network of five trails crossing the battlefield covers about 7.4 miles. I didn’t hike these – my blisters were still howling from walking all over the National Mall. From what I saw of them from the road, they looked like smooth, wide, easy-to-follow trails, but the terrain at Antietam is not flat, so expect some inclines. 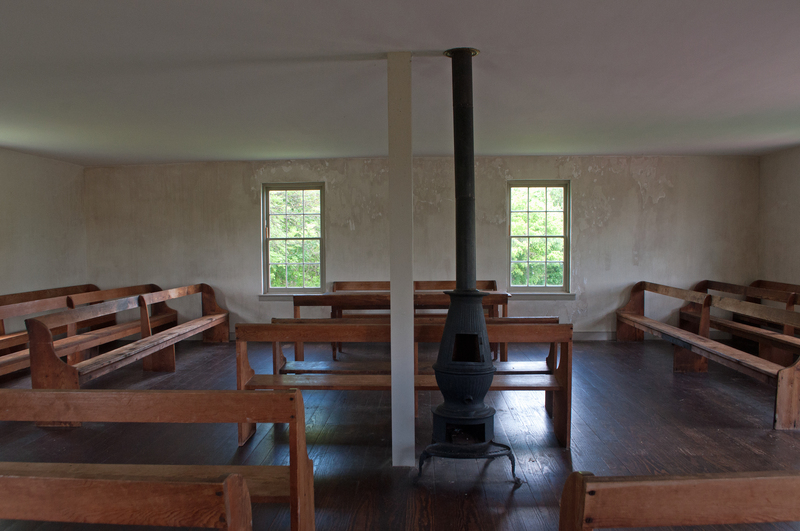 Visitors to the Antietam National Battlefield can go inside the Dunker Church. There is parking across the street, or accessible parking to the side of the building. What we did get out of the car for included the Dunker Church, which was one of the focal points of the battle, and was used as a temporary field hospital and later an embalming station before it was restored and returned to the faithful for services until the turn of the century, according to the NPS website. 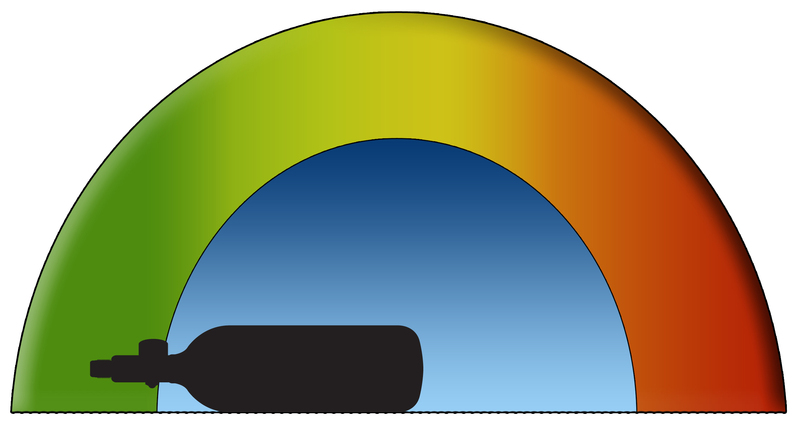 The driving tour gets a zero on the Gus Scale; there is nothing taxing about it. I’d estimate the trails around a three. They seem easy enough, but, again, those hills. We also stopped at Burnside Bridge, named for the Union general who captured it from Confederate forces during the battle. If you’re allergic to bee stings, send ahead a spotter or take an EpiPen. When we went through there was a horde of bumblebees dancing around one end of the bridge. 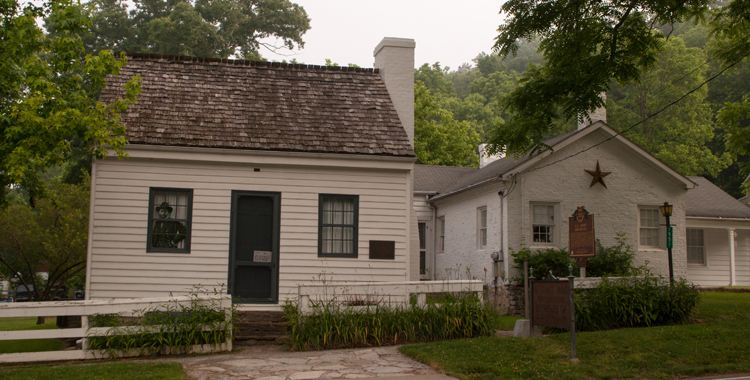 Ulysses S. Grant’s birthplace in Point Pleasant, Ohio, just a few hundred feet from the Ohio River, is a reminder that no matter where you begin in life, you never know where you may end up. Last Sunday, I opted for the small town explorations with Emme the Mutt in tow. She loves a good ride in car, just not for six hours, I eventually learned. But she also likes sniffing things, chasing geese into the river, and barking at bicyclists, so she had a great time. The morning was very foggy, and while visibility on the roads was fine, the fog was so dense over the river that I couldn’t see the other side. I have to admit, I kind of love fog. It can be annoying, and it wreaks havoc on the focus in my pictures, but I love the surreal feeling it creates. I took my favorite route along US-52, a scenic byway that runs along the southern border of Ohio on the river. My first destination of the day was to be Moscow, a map dot barely out of the river. I stopped off in New Richmond first to check out some points of interest (to be blogged about later). About five miles east of New Richmond, I stumbled through a historic district with ties to the Civil War. It wasn’t on my list for the day, and despite driving past it eleventy million times, I forgot it was even there. A simple white house behind a flagstone sidewalk anchors the district. Of course, district is a generous term because the white house, a well next to it and signage in the yard are about all there is to the space. A stern looking man will be peering at you through one of the front windows, and you’ll know you have the place. Ulysses S. Grant’s birthplace is in Point Pleasant, Ohio – not to be confused with the home of the Mothman in West Virginia. President Grant, in case you aren’t familiar, commanded the Union Army during the Civil War and accepted General Lee’s surrender. While being known for his military strategy and personal integrity, his presidency was marred by scandals. Good ol’ Unconditional Surrender had his humble beginning along the banks of the Ohio. He lived in that house for less than a year before his family moved about 23 miles away to Georgetown, Ohio. The thing I like most about places like this is that it reminds me that no matter where you start in life, you never know where you can end up. Grant started life as a tanner’s son along the Ohio River, and went to West Point against his will, according to the information boards outside the house. Even though his grades at West Point were mediocre – one would assume from not applying himself since he didn’t want to be there in the first place – he rose to command the armed forces of the United States, became President and traveled the world. 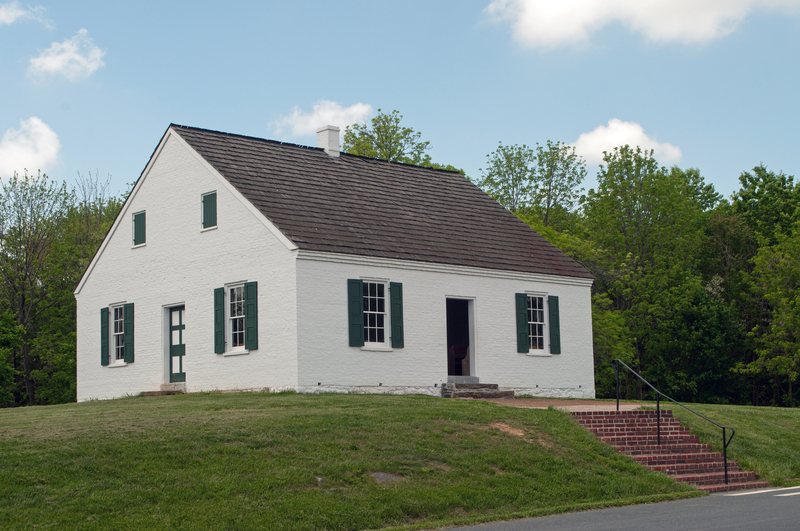 When you visit, you can tour both his birthplace in Point Pleasant and boyhood home in Georgetown and see the schoolhouse he attended. Fun fact: I lived a few blocks away from Grant’s boyhood home when I was a kid. I walked past it almost every day on my way to school. For more information about visiting these sites, you can check out the Ohio History website.